2. If you have a Garmin unit and have their program called “Mapsource” loaded on you computer, you can what they call “filter” a large number of points into a smaller set. What this actually does is to remove points that it thinks are not necessary. I’m not sure how good this is because it would I suspect remove some of the bends in say a windy trail. But they have it, so hopefully it works! Just start Mapsource, load the tracks you want to “filter”, right click on the tracks and select “Track Properties” and then click on “Filter” – select the option you want (no more than 500 points) and select “OK”. You can now load this to your GPS. 3. Other software will allow you to do basically the same thing as Mapsource about, but they call it “simplify” tracks. This means again that they will take a large number of points and try and reduce them using some kind of algorithm. I don’t have a lot of faith in this method, but they are there and that is what they do. There is one other situation this all comes into play, that is when you want to download other users tracks from websites so you can follow their route. I know that two of the major ones as of this writing handle the problem of a large number of tracks in different ways – WIKILOC – This website allows you to select the option of splitting a large number of track points into small segments. This will take care of everything. Most GPSs can handle multiple segments without any problems. Using this method you will get all the track points as they were uploaded. EVERYTRAIL – This website seems to reduce all uploaded tracks down to 200 track points. This will eliminate the 500 point problem, but it I’m not sure of how well it will reflect a windy trail. It is up to you to determine what your GPS unit can support. I suggest you look at your manual and also use “Google” to learn more about this subject. 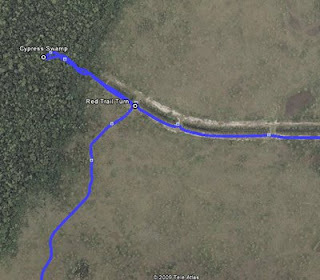 See my write-up on using WIKILOC downloaded tracks and waypoints for some more ideas. 2018-19 FWC Hunting Schedule Calendar - Look Before You Hike!